CA180260 – Construction Co. 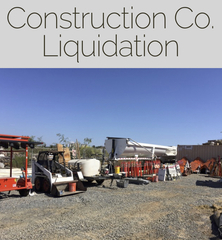 Liquidation on Behald of Secure Creditor – 2018 End Dump Trailer, Mini Ex, Equipment, Tools, Landscaping Supplies and More. AUCTION CLOSING DATE: Tuesday August 20th beginning at 10:37am PDT. Bidding closes the first item at 10:37am PDT then closes 5 items per minute thereafter to the last item in catalog order. LIVE INSPECTION: Monday August 20th 8:30am-2:00pm. REMOVAL: Thursday August 23th 8:30am-4:00pm and Friday August 24th 8:30am to 12:00pm by Appointment Only.